Welcome friends! It's Saturday again and time for the fourth and final week of birthday celebration at The Sweet Stop! I have had so much fun revisiting sketches from the past this month and hope you have, too. 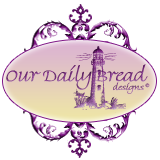 You'll have one more chance to choose your own sketch and the opportunity to win a $15 gift certificate to the Sweet 'n Sassy Stamps store. So let's get started! 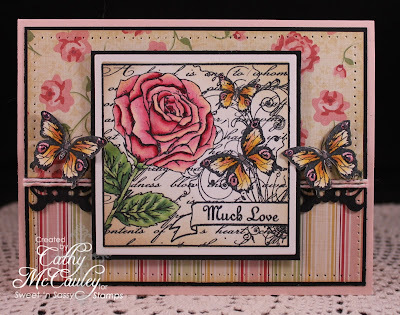 Creative Nugget: I needed one more Mother's Day card, so I chose a sketch that would show off the beautiful Rose Collage stamp set. The rose and butterflies were colored with copic markers and a little Antique Linen Distress ink was sponged around the edges to soften and distress the panel to match the pretty Cosmo Cricket patterned papers. Some paper piercing was done around the border before each layer was matted with black, my favorite, and mounted to a Sweet Blush card base. A border punch and some Baker's twine separated the two patterns and the main panel was popped on top. I colored and cut out two butterflies to replace the little side panels on the sketch. It's hard to see in the photo, but some Star Dust Stickles was painted on the rose and the butterflies' wings, and a little Glossy Accents was added to the tips of each wing, making the whole card sparkle! I like how this one turned out and hope my mom likes it, too! 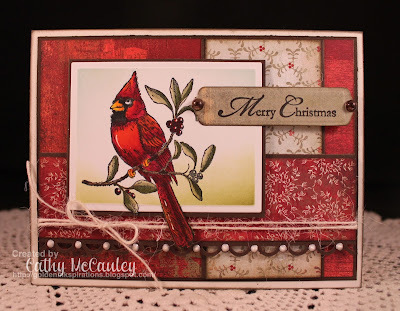 Sweet 'n Sassy Stamps is getting ready for another fabulous release so I don't have a Christmas version again this week, but hope to resume the Christmas card version next week...thanks for being patient with me in this regard! 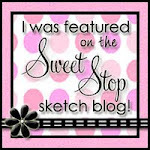 Be sure to stop by the blogs of the other Sugar Babies as each one has chosen a different sketch to highlight this week. When you play along, be sure to add a link to the sketch you used and add SSS156 to the key words if you upload to an online gallery. Thanks for stopping by! 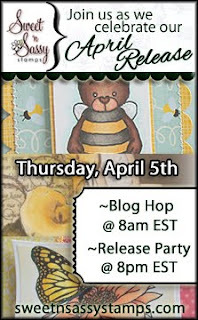 Have fun stamping this week and be sure to stop back again on Thursday to enjoy the May Release Blog Hop! Welcome friends and a big happy Saturday to you! It's time for week three of The Sweet Stop birthday celebration! Once again the Sugar Babies have chosen their favorite sketches for their samples. That means to play along, you will get to choose the sketch you want to use! Of course there will be another PRIZE given this week...a $15 gift certificate to use at the Sweet 'n Sassy Store! 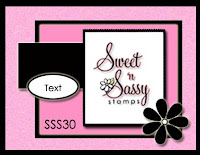 In addition, Mr. Sweet 'n Sassy is celebrating his 40th birthday, so from now until the 25th of April, Sweet 'n Sassy Stamps is offering 40% off everything in the store. Now's the time to stock up on all those stamp sets and dies you have on your "Wish List!" To create the main panel, Spun Sugar, Victorian Velvet, and Antique Linen Distress inks were smeared on a craft mat and spritzed with water. A piece of Vintage Cream card stock was dabbed several times in the ink and dried with a heat gun. The Paris collage from the "To Paris With Love" clear stamp set was stamped on the background with Versafine Onyx Black. The image was then die cut with a rectangle Nestie. Parts of the collage were stamped on patterned paper, cut out, and popped up in the corners. 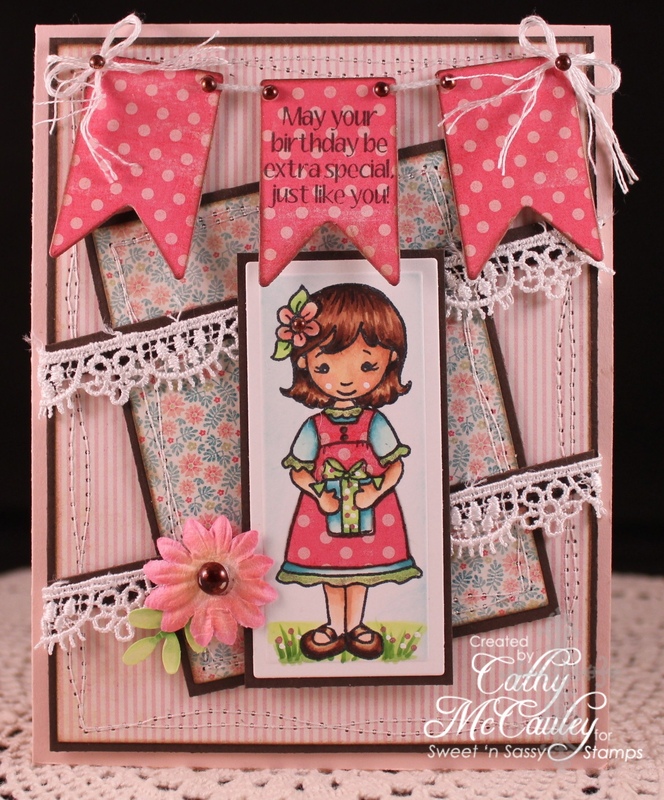 The patterned papers were stitched to kraft card stock and layered onto a Vintage Cream card base. Some lace and a scalloped border were added. The sentiment, some pearls and a Mulberry flower finish the card. 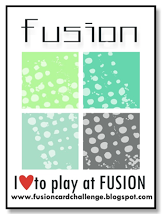 I hope my card inspires you to play along with us this week. Be sure to check out the other Sugar Babies for additional inspiration. Welcome friends! So many happy events going on today! 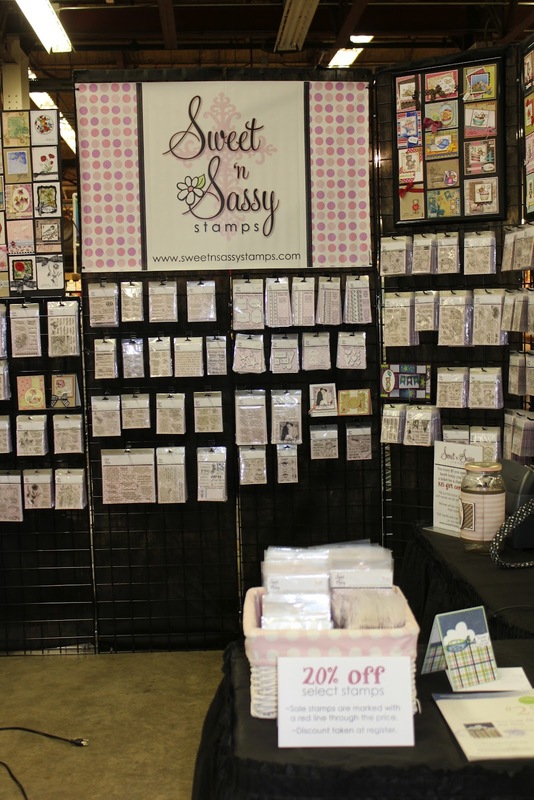 This weekend is the Heirloom Paper Crafts Show in Allentown and Sweet 'n Sassy Stamps has their booth all set up and ready to go. 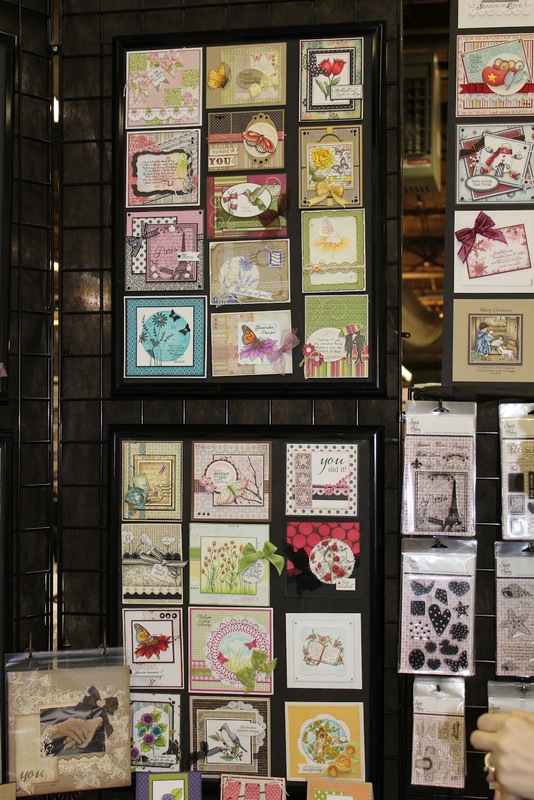 If you're in the Allentown, PA area, stop by to say HI and catch a glimpse of the new stamp sets being released in May...that's right...you'll have the opportunity to purchase these fabulous sets BEFORE they are even released! Yours truly will be working at the "Make & Take" table so be sure to introduce yourself if you get a chance to stop by! It's also time for week two of celebrating three years of wonderful sketches at The Sweet Stop. The Sugar Babies have chosen their favorite sketches for their samples today. To participate, you will choose the sketch you would like to play along with...AND...of course there will be a PRIZE again this week! Get ready for some fabulous eye candy as you visit the blogs of each of the Sugar Babies...then choose one of your favorites to play along! 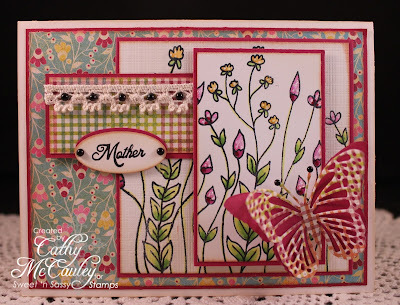 Creative Nugget: The new clear stamp set, Flower Field, was used to create my Mother's Day card. Some BasicGrey Lemonade paper was perfect for the background. Copics were used to color this fun image to match the flowers in the background. The flowers on the top layer were given dabs of Stickles to make them sparkle. Texture was added to the first layer of flowers with a canvas impression plate. 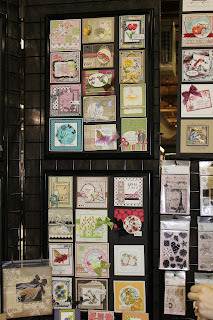 Each panel was layered onto Purely Pomegranate card stock and then onto a Vintage Cream card base. 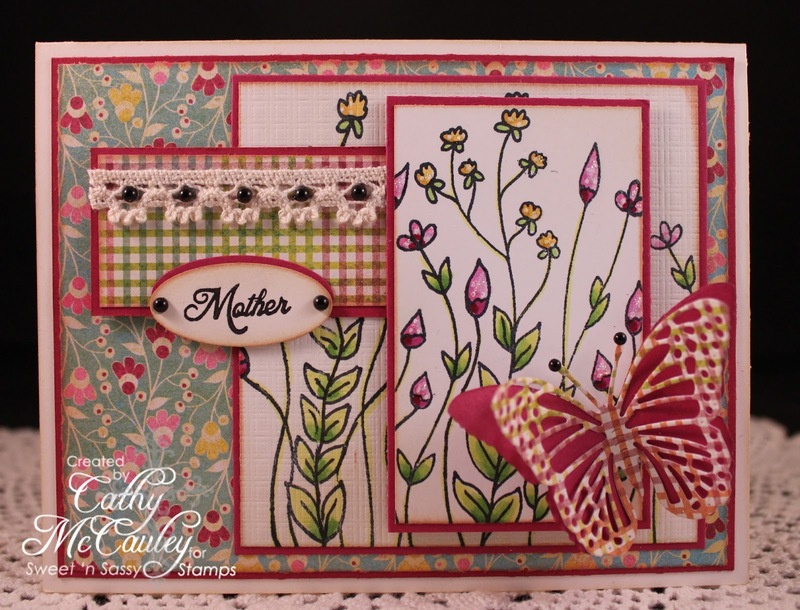 A Cheery Lynn butterfly die was added to the lower corner and some lace and pearls were added to the sentiment panel. The sketch I chose for my card was SSS30. Take a look at what the other Sugar Babies chose! I had so much fun checking out the sketches you chose for your samples last week...Hope you will get a chance to play along again this week! Use the tab SSS154 when you link up your card. Have a fabulous weekend! 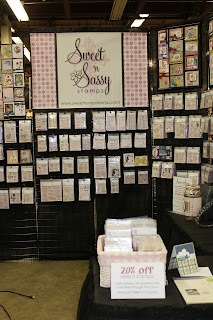 I'll leave you with some pictures of the Sweet 'n Sassy booth at the Heirloom Show in Allentown! Happy Saturday, friends! Can you believe The Sweet Stop is celebrating three years of sketches! We will be celebrating in a big way for the whole month of April! Each week the DT will be revisiting some of their favorite sketches from the past. To participate, you will choose the sketch you would like to play along with...AND...of course there will be PRIZES each week! 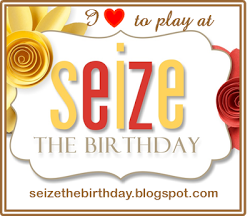 Get ready for some fabulous eye candy as you visit the blogs of each of the Sugar Babies...then choose one and play along! 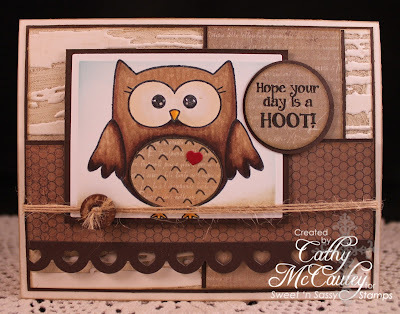 Creative Nugget: I decided to use one of the brand new sets just released Thursday at Sweet 'n Sassy Stamps, "Owl Be There" What an adorable owl and seven owlish sentiments to use all through the year! 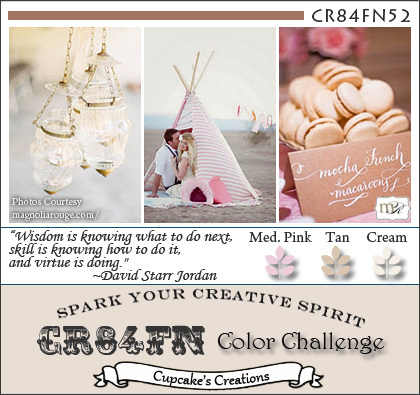 I made a monochromatic birthday card to also qualify for two of the release party challenges over at Splitcoaststampers...Taylor's birthday card challenge found HERE, and Giovana's monochromatic challenge found HERE! You have until Monday evening to play along with these challenges as well and of course more PRIZES are up for grabs! This sweet owl was colored with copics and his belly was paper pieced. Glossy Accents was added to his eyes to give them some life and a little heart was added to the belly. Some light sponging with distress inks were used to frame him a bit while the panel was still in the die. The layers were made from some BasicGrey patterned paper and mounted on Early Espresso card stock. The Vintage Cream panel in the background was made by inking up the Tim Holtz embossing folder with Burlap Distress Ink before putting it through the Big Shot. 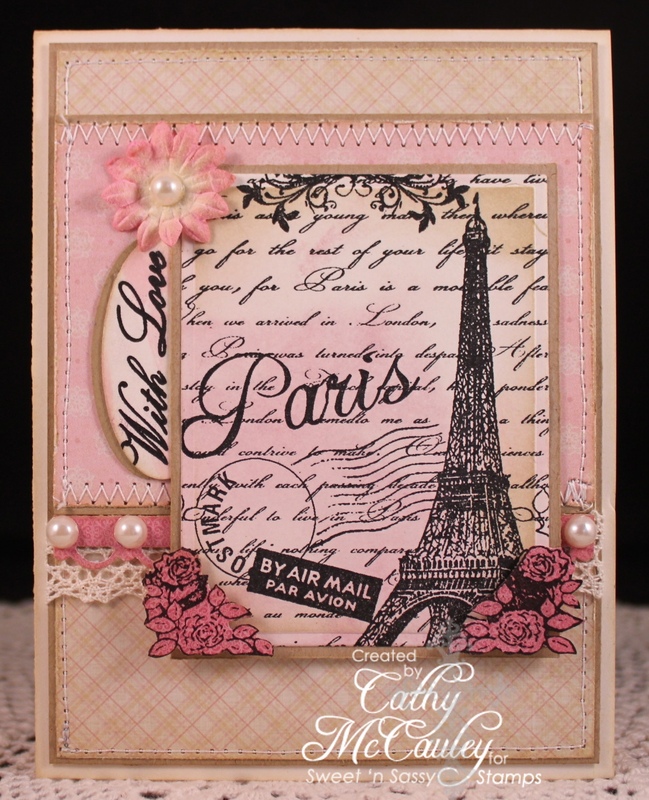 Everything was layered onto Early Espresso and a Vintage Cream card base. A button and some button twine were added to give him a perch on which to sit and the scalloped heart border added to the horizontal panel finished off the card! 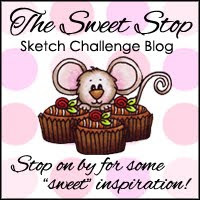 The sketch from the past I chose to use was SSS81, but when you play along, please use the keyword SSS153 on your sample when you upload it using the Linky tool at The Sweet Stop! 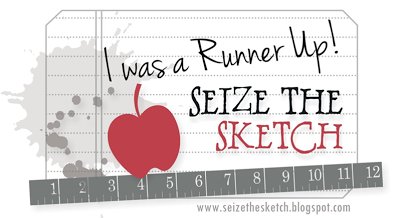 Be sure to let us know which sketch from the past you decided to use! I can't wait to see which sketch you choose to play with! Thanks so much for stopping by. Have a FABULOUS EASTER!! 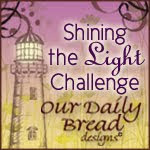 If you've just arrived from Monika Davis' blog, M.A.D. Stamper, you're on the right track. If not...head on over to the Sweet 'n Sassy Stamps Blog to start the hop at the beginning. You won't want to miss any of the wonderful eye candy the DT has prepared for you today! 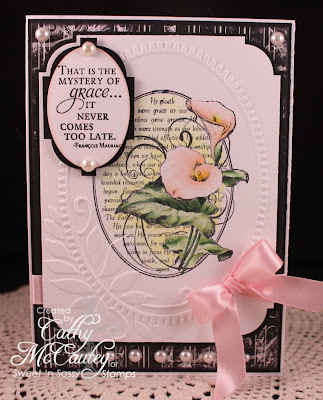 Creative Nugget: My first sample uses a gorgeous clear stamp set designed by Dina Kowal called "Graceful Calla Lily." This set has one image and six wonderful sentiments all about the wonderful grace of our Lord. The fine detail of this stamped image makes it very easy to color with any medium...copic markers were used in my sample. The calla lily was stamped inside an embossed frame and the corners rounded with a corner punch. This was layered onto Bo Bunny patterned paper, True Black card stock, and a Select white card base. The sentiment panel was made with the same corner punch. Pearls and a bow were added to complete the card. Creative Nugget: Cocoa's back...this time celebrating boys in this new clear stamp set called "Special Boy Cocoa." With two fabulous Cocoa images and four sentiments perfect for every occasion, you'll want to add this set to your Cocoa collection! 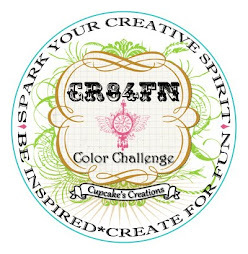 The Cocoa image was colored with copic markers and fussy cut. He was popped up on several layers of BasicGrey patterned paper. Did you notice the train tracks? They were made with the new fence die being released tonight. The tops of the fence posts were cut off and...you've got instant train tracks! Make plans to join us tonight over in our member company forums on Splitcoaststampers for our New Release Party! 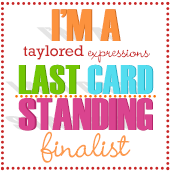 We'll have full reveals of each fabulous stamp set, fellowship and chatter with friends, fun challenges, and more! Also.....did you know today is Korin's birthday?! Isn't that fun? 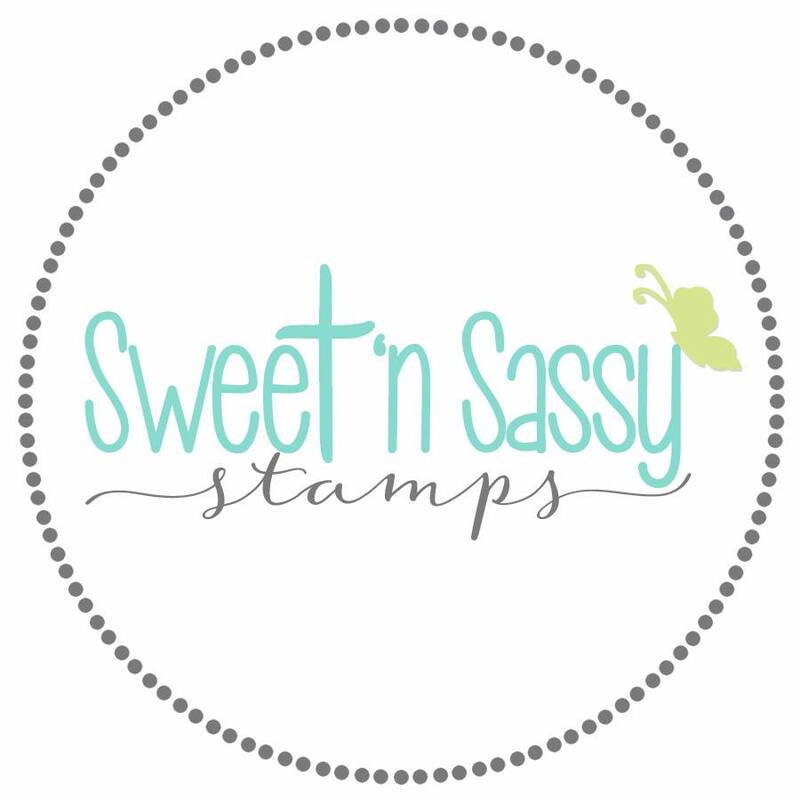 To celebrate, Sweet 'n Sassy Stamps will be giving away a $34 gift certificate to the store. 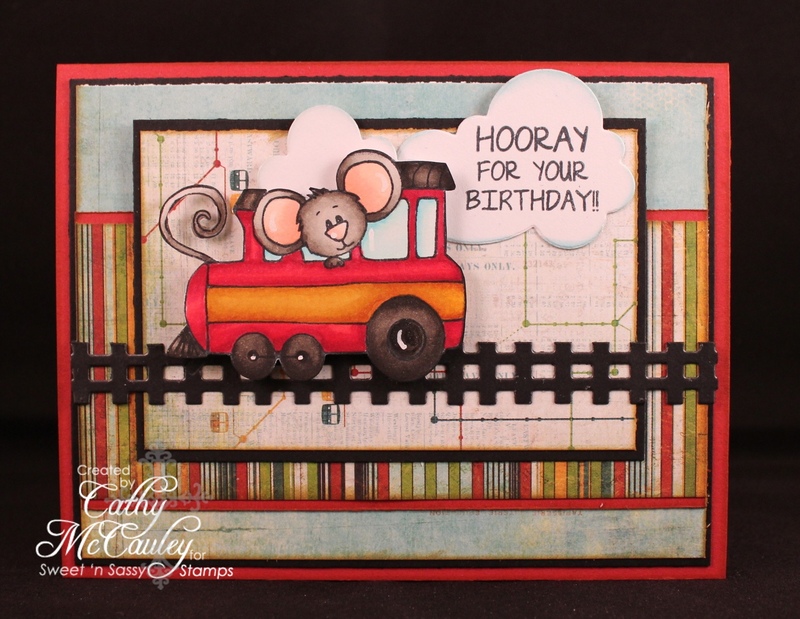 All you have to do is leave Korin some birthday wishes over on this photo on the Sweet 'n Sassy Stamps Facebook page. Welcome friends...I'm so glad you were able to stop in...you are in for a real treat! I'm a day early with a very special birthday surprise....tomorrow is my dear friend Korin Sutherland's birthday! 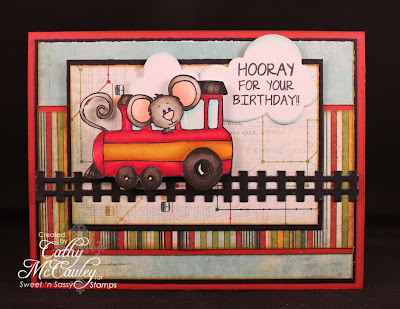 A group of her friends are getting together today for a fun, early birthday party because tomorrow is the fantastic April Release Blog Hop for Sweet 'n Sassy Stamps, and we didn't want to take the spotlight away from that. After all, our sweet girl deserves her OWN day in the spotlight! So please join us as we celebrate Korin's birthday a little early! After all - you can never have too much celebration, can you?!?! 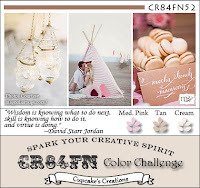 If you've just arrived from Brenda Weaver's Sweet Paper Treats Blog, you're on the right track. If not...you may want to go back to Taylor Usry's blog to start at the beginning. Creative Nugget: This sweet little girl is for a very sweet friend...Korin! She is from the Special Friends clear stamp set by Sweet 'n Sassy Stamps and is all colored up with copic markers. Her dress is paper pieced to match the pennant hanging above her. 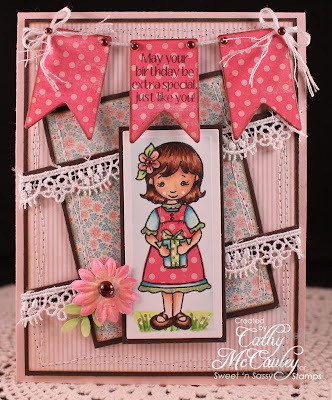 A little lace, some messy stitching, and some pearls complete this sweet birthday card! Have a wonderful day, Korin! Head on over to Makiko Jones' Mak Ink Studio next for some more birthday sweetness! Thanks so much for stopping by! Come back again tomorrow for the fun April Release Blog Hop!